The central government of India, under the leadership of Prime Minister started the unique Sukanya Samriddhi Yojana. It can be categorized as one of the small savings investment plans. The main objective of this scheme is to assist the parents in securing the economic future of the female child and support her dreams of acquiring higher education by saving money in small amounts, on a long term basis. Only for Indian Citizens – The benefits of the scheme are available only for those girls who are born within the borders of India and plan on staying in the country for the entire tenure of the SSS. The NRIs will not be permitted to invest in this scheme. For girls under the age of 10 – The guidelines of the SSS clearly highlight that only those parents will be allowed to open the account and invest money who have daughters who have still not attained the age of 10 years. If you are interested in the opening an account for your daughter, then taking a look at the salient features will assist you in understanding the scheme. Interest Rate – If one compares the rate of interest of the SSS with the other investment plants like PF or any other, then it can be said that people stand a chance to get more money as the rate of interest is high. But there is one glitch in this. The rate is not fixed and will depend on the situation of the economic market. For instance, the rate was a whopping 9.1% during 2012 – 2015. It was raised to 9.2% during 2016 – 2017. Since then, the rate has only gone downhill and currently it is 8.1%. Taxation (80C)There are 2 points to this entire procedure where the first is the sum that is contributed every year. The investment here is can be claimed under section 80C. Interest Paid under this scheme is also tax free. So it comes under EEE category.Note :- You cannot claim more then Rs 1.5 Lakhs in section 80C, this includes all your investment. For example you have invested rs 1.5 Lakhs in your PPF and rs 1.5 Lakhs. This makes you investment to rs 3 lakhs. But you can claim a max rs 1.5 lakhs only as tax free amount. Transfer of Existing Sukanya Samriddhi Account – The parents can open the Sukanya Samriddhi Account in any branch of the 28 listed banks or in the post office as well. The government has provided the facility of transferring the account not only from one part of the country to another but also from the bank to the post office or in the reversed order. Loan against SSY – Many schemes have a special feature under which, the account holder will get the permission of applying for a loan against the account. But this facility is not available under the SSS. The money is kept safe until the maturity period is reached. SSY Lock-in Period – There are different opinions that people have about the lock-in period of the scheme. The inability of accessing the funds before the girl turns 18 is seen by some as a positive aspect while others see it a negative quality. The tenure of the account will be counted from the very day the opening of the account is done. SSY Maturity – The money deposition in the account will be stopped as soon as the girl gets married after attain the legal age of 18. If not, then the maturity tenure of the SSA is 21 years. The operations will continue for 21 years, starting from the day open the account. After the completion of 21 years, the money will be handed over to the account holder. If the girl gets married on attaining 18 years, the account will be closed before the specified time. Withdrawal Rules – According to the rules of the scheme, the account holder will only be able to get the accumulated sum and the interest earned on it, only when the maturity tenure of 21 years have been completed or the girl completed 18 years and got married immediately afterwards. Pre Mature Withdrawal Rules – Unlike other schemes, the SSY will allow the account holders to make premature withdrawals from the account. But that too has to be done under some airtight rules. Once the account holder reached the age of 18, she or the parents will be entitled to withdraw only 50% of the total amount that has accumulated in the account. But the only purpose of the withdrawal must be for aiding the higher education of the candidate. SSA Calculator – Getting an estimate of the maturity amount, at the end of the entire tenure will be easy if you make use of the SSA calculator. All you need to do is feed the formula in the excel sheet and enter the amount that you intend to deposit. You will get the results both on yearly and monthly basis, depending on the deposition method. Elimination of mistakes is very easy with the use of this calculator. Sukanya Yojana Chart Monthly Contribution Table :- We are assuming that customer pay monthly investment before 5th of every month for 14 years. We are assuming customer would deposit this money before 5th April each year for 14 years. 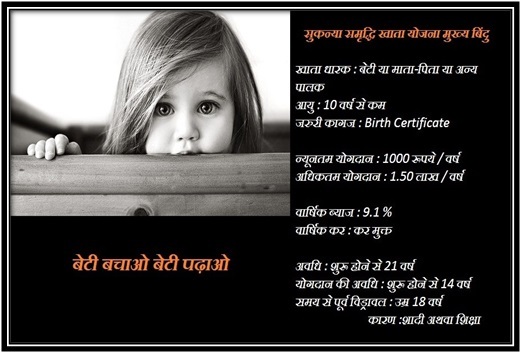 Birth certificate of the girl – There is an age limit for opening the SSA. The account can only be opened in the name of girls who are less than 10 years. For this, it is mandatory for the parents to provide photocopy of birth certificate of the female child. The birth certificate will support the age claims. Address proof of the guardians – To make sure that the child and the parents are residents of the country, producing the photocopy of the legal address proof is a must. PAN card, Voter ID card or Aadhar Card will be enough. Identification proof of the parents – Only the legal guardians, birth or adopting parents have the right to open an account for securing the future of the girl children. Thus, to support the claim, the parents will have to produce ID proof. For opening the SSA, the parents or the authorized guardians will have to fill an application form. As the account can be opened in banks as well as in the post offices, all you need to do is walk into the institute of your choice and collect the Sukanya Samriddhi Account application form from the respective counter. If you like to register under the process via any bank portal, then visiting the appropriate link is a must. There are two separate ways by which an interested candidate will be able to apply for the benefits of the scheme. One is the online process and the other is the traditional offline process. Here, you will acquire information about both the methods. There are 28 banks registered under the scheme and whichever bank you choose, you will have to click on the authorized site of the bank and enter their home page. Once you are in the home page, you will have to click on the link that will redirect you to the SSS page. The next step is getting the registration done. After reaching the page of the scheme, you will have to click and get the registration form. Filling the form with the residential details and identification of the girl and the parent/guardian is necessary. The authentication of the details is a must. The task of verifying the details rests on the shoulders of the bank authorities. For this, you need to upload the Aadhar Card, PAN card or any other official document. After this, you need to submit the application form by clicking on the “Submit” link. After the submission of the form, the account needs to be activated by making the first deposit. Net banking will assist you in tackling this part. With the successful activation and disposition of the money, you will start getting notifications from the bank. Every time you make a deposit, the notification will be sent on the mobile vis SMS. A high percentage of people in the country, both in the rural as well as in the urban areas, do not have the adequate education for understanding the online application process. For their assistance, the government has kept the facility of offline application. This process can be carried out in the banks and the post offices as well. Parents/legal guardians who wish to secure the future of their girls with the assistance of the SSS must walk into the nearest Post Office or branch of the chosen bank. Once you reach the institute, you need to collect the application form for SSY from the respective counter. After the form has been collected, you need to fill it up with all pertinent information about the birth date of the girl, the residential address, your relation with the girl and so on. You also need to provide your phone number. Double check the information entered in the form, and then attach the photocopies of the required documents with the application form. These documents will assist the authority in making the verification of the details. When the form and the papers are submitted at the right counter, the person will do the necessary checking. If everything is found to be in order, the bank manager or the Post Master will open the account under the SSY. Once the account has been opened, you will receive a passbook from the bank or the post office. The passbook will contain the record of transactions made in the SSA. Once you get the passbook, you must activate the account by making the first monetary deposit. According to the guidelines of the scheme, the permission of opening a Sukanya Samriddhi Account, by the NRIs has not been given by the government. It is a small investment scheme that is open for the people who are authorized citizens of India. If any one parent is an NRI, then he/she will not be allowed to operate the account. High rate of interest – If you compare the other small investment schemes of the government with the SS program, you will see that the rate of interest that the government is offering is much higher than the others. Saving money on tax – To encourage more people in taking part in the scheme, the government has declared that all the deposits done under the plan will not be included under taxation. Thus, tax exemption under Section 80C is available. Easily transferable – If you are moving from one part of the country to another, you will be able to transfer the SS account juts by filling a form. If you want to transfer the account from bank to post office or vice-versa, then that too is possible. Permission of operating the account to the girl – It has been mentioned in the guidelines of the scheme that the girl in whose name the account has been opened will be able to monitor the account after completing 10 years of age. Deposition of small amounts – There is no bar on the amount that can be deposited in the SS account. It can be as low as Rs. 1000. So, people from all sections of the society will be able to avail the services. Payment directly made to the candidate – Once the tenure of 21 years is over, the money will be directly transferred to the girl in whose name the account had been opened in the first place. Partial withdrawal is also available under certain circumstances. Account for adopted girl – The guidelines has also provided facility of opening the account not only for the biological girl child but also for the girl child that the parents have adopted via legal procedure. Apart from availing the facility of opening the SS account in the post office, one can also opt for the same service in any of the 28 banks, which have been permitted by the government of India. The list contains all the nationalized banks and some of the private commercial institutes have also been included as well. Verygood yojana for my baby’s future. you are great PM in this world. This SSY is one of the Zenith efforts of our Honorable Prime Minister to uplift the status of life of girl child of our country. Can I transfer SSY account from post office to bank,online,? Also facility to transfer money from Post office SB account to SSY account is a drawback. no you will have to make a manual request for account transfer. I have opened an account for my daughter with Post Office. Is there a procedure to give an auto debit from my HDFC credit card. This gives an ease of proper deposit as there is cash crunch too. no this kind of facility is not available in post office as of now. You can transfer your account in any bank then your purpose would be solved. Any other plan for 10 yrs old girl child. I have started depositing money in SSY scheme for my daughter at her age of 10 . Now her age is 13. I am paying Rs.1000 every month.My query is up to what age i have to pay the premiun for her and when will it get matured? What about the matured value if iam depositing regularly?